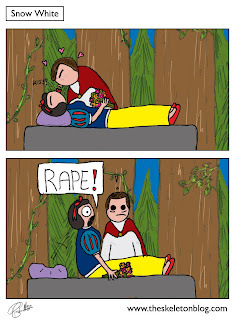 It always seemed weird to me that Snow White woke from her sleep with a kiss from a stranger….seems a bit rapey to me. What’s that saying ‘unless she says YES it’s a NO’. That doesn’t seem to apply here. Maybe it was ‘kiss first, ask questions later’ or ‘blink once for YES and twice for double YES’. If I was wondering round the forest and I came across a comatose princess, I wouldn’t be rushing across the undergrowth to cop a feel (my other half would have something to say about that for a start), I’d be calling an ambulance or I’d finish digging that shallow grave and get the hell out of there.